A collector owned 1966 Mustang Coupe with 33,000 original miles, it was purchased by me on October 16, 2012. I am the fifth documented owner. A near perfect example of an unrestored car featuring the rare metallic “Emberglo” paint, it was assembled in Dearborn, Michigan on June 10, 1966 and shipped to Campbell Ford Inc. in Waterbury, Connecticut, where it was purchased by the original owner, Dagmar Holmes, on July 7, 1966. The Mustang retains 100% of its original paint, body panels, chrome, interior, motor and transmission. It has never been disassembled and is totally rust-free from top to bottom. It has received regular maintenance and replacement of normal wear parts, such as tires, brakes, belts, hoses, battery, etc. I have the original title, window sticker, owner’s manual, warranty card and other miscellaneous documentation. This mustang is a consistent winner at local and regional events and was awarded 1st Place Unrestored Gold at the 2006 Mustang Nationals, in Sturbridge Massachusetts. It has also been awarded 1st place in the Antique Automobile Club of America regional events and has appeared in a national classic car calendar. Most recently, at the Hemmings Motor News 2016 Concours D’Elegance at the Saratoga Automobile Museum, it was awarded 1st Place in the Preservation Class. Purchased in September 2005, I am the third registered owner. With 80,000 miles, this Mustang retains all of its original body panels and approximately 95% of its original paint. The interior, and trunk compartment is all original and untouched. The convertible top was replaced in 2006 and the engine was pulled and detailed also in 2006. The underside is clean and rust free and still shows signs of factory applied undercoating and body primer. 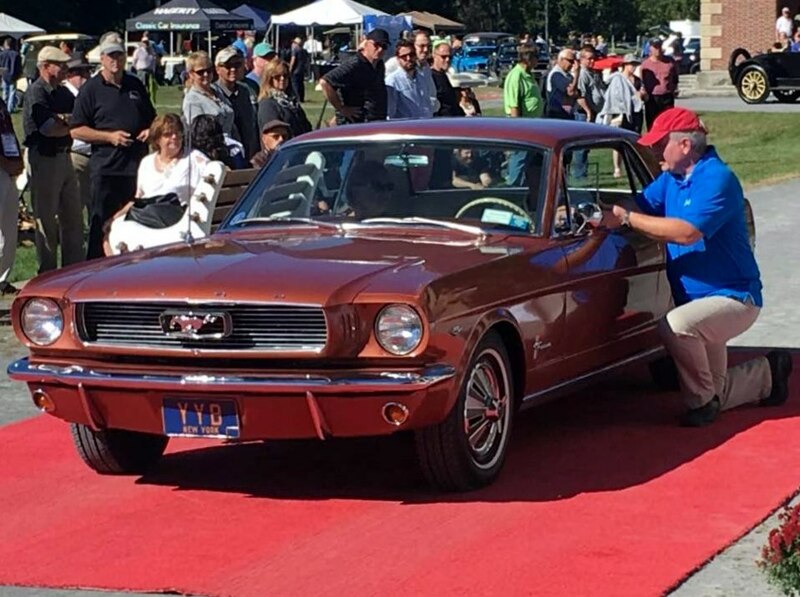 A consistent winner at regional Mustang and local shows it has also participated in regional Antique Automobile Club of America events with a 1st place award. The mustang has a rather unique and documented history. It was manufactured in Metuchen, New Jersey on December 10, 1965 and shipped to Jacksonville Florida, where it served as a rental car until it was purchased by the original owner, William C. Keppler of Floral City, Florida on Novembr 29, 1966 from the Northgate Ford dealership in Tampa, Florida. I have the original title, owner’s registration, sales invoice along with other miscellaneous documentation. I purchased this Mustang on November 12, 2015. It was built at the Metuchen, New Jersey plant on November 13, 1967 and delivered to the Smith-Cairns Motor Sales Co. in Bronxville, New York. It was purchased by Adeline Brassillio on December 20, 1967. The Mustang was registered and driven until placed in storage in November 1998 with 48,122 documented miles. After approximately 14 years in storage the Mustang was purchased by Jeff Gill in April 2012 and underwent a cosmetic restoration beginning in 2014. The restoration began with the intent of maintaining as much of the originality as possible. With original rust free body panels, a fresh coat of Brittany Blue paint was applied. Added was a reflective C stripe tape, along with a low-gloss, black paint application to the hood louvers. The rust free undercarriage was cleaned and detailed and a dual exhaust was also added. The Mustang retains all of its original exterior trim. The interior, with the exception of the front seat covers, instrument bezel, and a refurbishing of the steering column remains as it was in 1968. The engine compartment was refinished, with special attention to leaving the original factory markings untouched. The engine and transmission are original to the car. This Mustang is an excellent example of how an original car can still maintain its originality when combined with a carefully planned cosmetic restoration. It was obvious that a total restoration of this Mustang was not necessary. As one who appreciates original cars I retained the original seat covers and the original instrument bezel. I have the original owner’s manual, owner warranty identification card, the owner quality care card and related brochures included with the original sale. Also are miscellaneous service records verifying the accuracy of the mileage. With a recent best in class award, and featuring a unique blend of originality combined with a new look, this Mustang is ready for the show car circuit with an odometer reading of 48,752 original miles.